Well Beauties, the weather is finally taking a turn for the cooler side here in the ATL...Fall! My favorite time of year. Every year I have the same challenge as we transition from fall into winter...extremely dry skin. 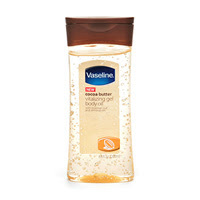 Starting wth the battle early this year, I now have a new obsession, Vaseline Cocoa Butter Vitalizing Gel Body Oil. This product is infused with brazilian nut and almond oils which are both hydrating oils that absorb into the skin and create a barrier of moisture. I put this on while I am still wet after my shower and pat dry. My skin is soft, silky and has a healthy glow all day. $3-$6 at drugstore nationwide.